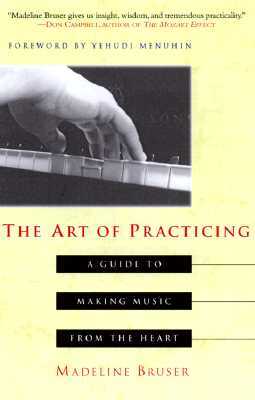 I came home yesterday and found that my boyfriend had been reading the wonderful book The Art of Practicing by Madeline Bruser, which was given to me years ago by the wonderful department of music of Kalamazoo College. I read through the book again and came across the part where the author explains the different types of struggles that performers can go through. Here they are. Overstated Passion: That's when we over do it, when we want to prove how great we are and how inspired we are. We turn any subtlety into cheesy stuff. We just have to remember that we are the link that allows a silent sheet of music to turn into sound, and that it's about the art, not us. Avoidance: Bruser writes: "Sometimes we try to play it cool. We say to ourselves, "Hey, it's no big deal. Just lie back and play the notes." And that's about all that comes out. Notes." That's when we turn into robots, and become a machine of technique. We don't even like it ourselves, so why would anyone else?! Aggression: That's when we want to do well so much that we tense up just at the idea of playing and taking the risk to make a mistake, and that's just what happens. We tense up, get scared of making a mistake and make a mistake. Then we decide that we really know what we are doing and that we are really going to play with no mistake, so we tense up and get scared about making mistakes, and.... It's a vicious circle. The interesting thing is that after that happened a few times we do the exact opposite, which is to focus on breathing and being relaxed, and that still takes us away from the performance. Awareness of who we are is truly what is needed in order to be a good performer, so that we can catch ourselves when we are struggling in any of the ways described above.